This report allows you to track backup and replication jobs whose backup files and replica VMs grow too fast and may quickly consume storage space on the target repository or target datastore. The VMs with Largest Change Rate (GB) and VMs with Least Change Rate (GB) charts displays the most and least active VMs in terms of the amount of data changes that occurred on their virtual disks. The Details table provides information on the list of VMs included in the backup and replication jobs, the average and aggregate amount of data changes that took place during the specified reporting interval and the size of the current full backup file*. To perform incremental backup, Veeam Backup & Replication needs to know which data blocks have changed since the previous job run. For VMware VMs with hardware version 7 or later, Veeam Backup & Replication employs VMware vSphere Changed Block Tracking (CBT) — a native VMware feature that backs up only the list of VM blocks that have changed since the last run of this particular job. Use of CBT reduces backup session duration, and increases the speed and efficiency of block‑level incremental backups. 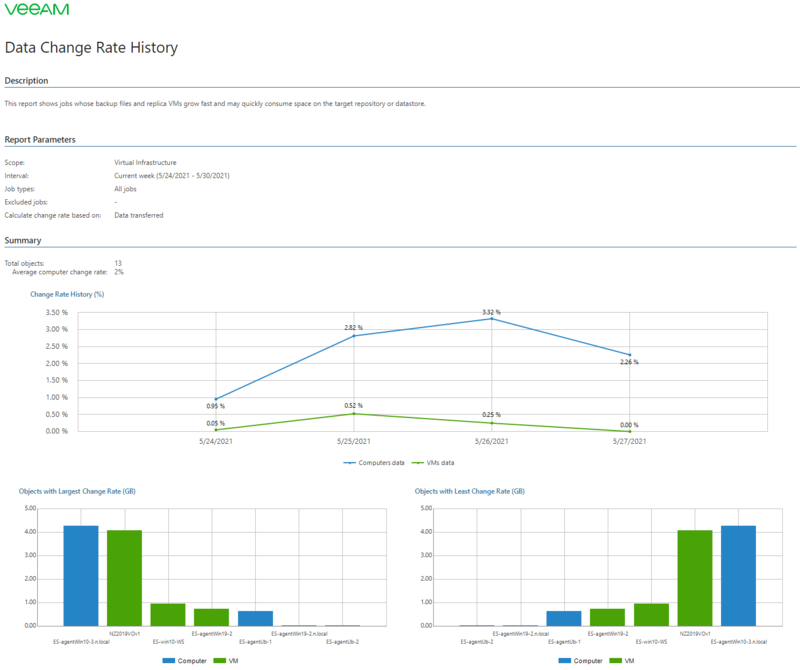 The report analyzes changes occurred on VM disks and estimates the amount of changed data. This can help you decide whether to allocate more space on the target repository or datastore in case VM files grow too fast. The report is also handy for people planning to do replication as a way to figure out if their bandwidth can handle the replication. Scope (VI): defines a virtual infrastructure level and its sub-components to analyze in the report. Scope (VMware VM folders): defines a list of VMware folders to include in the report (applies to VMware vSphere environments only). VM folders is an alternate way to present the virtual infrastructure. If VMs in your infrastructure are grouped into folders according to their profile, you can limit the report scope by specifying the necessary folders only. Interval: defines the time period to analyze in the report (Current week, Past week, Past month). Job type: defines a job type that should be evaluated (Backup jobs only, Replication jobs only, All jobs). Exclude Jobs: defines a list of backup and replication jobs to exclude from the report. *Note that no data will be available for synthetic or reversed backup, as well as for replicas.